Tehran, Sept 3, IRNA - Political factions and parties in Iraq must gather under one umbrella of the new government to form a strong and unified front against ISIL terrorists, wrote Wednesdayˈs edition of ˈIran Dailyˈ. It is very optimistic to expect the new Iraqi government to restore calm and stability to the embattled country within a short period but it seems Prime Minister-designate Haider al-Abadi will be able to bring unity to Iraq should he avoid adopting an ideological viewpoint and choose his cabinet democratically to serve national interests and satisfy all political and ethnic groups as well as the Shia and Sunni religious authorities, the English-language daily added in its Opinion column. 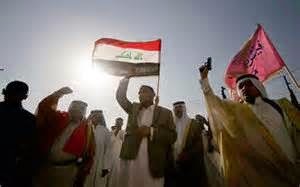 Abadi should bring together all political and tribal leaders to crush ISIL and extinguish the flames of civil war. This policy can help the Iraqis contain and ultimately eliminate bloody extremism currently being practiced by ISIL. Extremism is mainly an ideological issue and cannot be wiped out through military action in a short time, believes the paper. In fact, as long as there is a common enemy, namely ISIL, Iraqi political groups have no way but to back the new prime minister, no matter whether they are sincere or not. It’s a must for them to do so. It is highly anticipated that after the threat of ISIL is completely countered and the Takfiri group is pushed out of Iraq, then parties will gradually begin to make their real demands. However, at the end of the day, Iraq’s future will heavily depend on the performance of its new government and Abadi himself in particular. He should do his best to maintain the current national consensus by appointing individuals from across the political spectrum in his cabinet. Undoubtedly, stances adopted by Iraq’s neighbors or other influential countries with interest in the crisis-hit state will have an undeniable impact on the future of Iraq and the fight against ISIL. Given that Iraq’s neighbors have always had a fixed stance and that they have voiced support for the new government, Baghdad will be able to overcome the ISIL challenge if it continues to keep up the backing of its neighbors. No doubt, security and tranquility in Iraq will be in the interest of its neighbors and the entire Middle East and it appears that those countries acknowledge this reality. That’s why Iraq’s neighbors took wise and similar stances vis-à-vis developments in the Arab country. Outgoing Prime Minister Nouri al-Maliki drew commendation both at home and abroad by respecting the demands of the country’s political and religious elite to relinquish power in favor of Iraq’s integrity. Maliki’s decision to cede authority showed his full understanding of the current realities on the ground. In fact, he acted in line with Iraq’s national interests, wrote the paper in conclusion.